It’s Day 10 of 12 of London Film Festival, and after a decent enough day yesterday (with ‘The White Crow’ and ‘The Favourite’) today got itself back on track by being its now-standard disappointing self in the end. But not this premiere : this one was cool. It’s the one that came after, that I waited in town for another 2.5 hours for, only to…. we’ll get to it. But first, this one. The smaller Friday Setup meant when I showed up at 11:30 (an hour AFTER they usually hand out wristbands) and I was told it’d be another hour until they were available, I left and came back… and they were all handed out. Well… swell. Weirdly, I made it into a pen anyway, wristbandless. In even better news, Edith Bowman, podcastress supreme and a sure sign that a premiere is “real”… is here! Nobody had told Frank that taking photos of the faces on The List to use in case the ‘real’ photos didn’t turn out wasn’t cool. And/or nobody else had ever thought of it. And/or nobody expected those hairstyles to last. He doesn’t need to see your identification. Either of his fists can pretty much pierce your soul. Probably not Robert De Niro, but we live in hope. 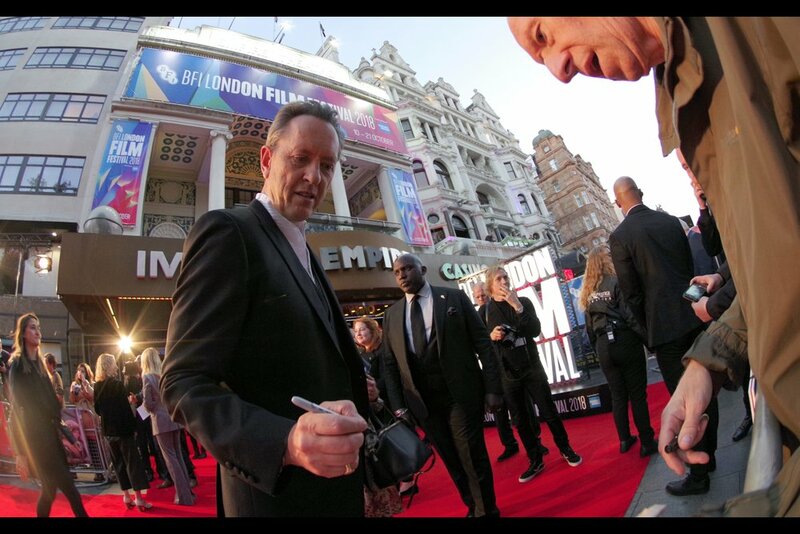 Richard E Grant has an imdb entry complete with entries for Doctor Who, Downton Abbey and even the upcoming Star Wars Episode IX. Although, I really disliked the movie ‘Withnail and I’. Even after I found out it was ironic. And… wait, he’s been in GAME OF THRONES?? “That’s right - Three episodes! You were so busy still hating me for ‘Withnail and I’ that you totally missed me in not one but THREE episodes of Game of Thrones”. Well, I’ll be…. In case the question ever needs to be answered, it apparently takes no less than SEVENTEEN people (pictured) to interview just three people. 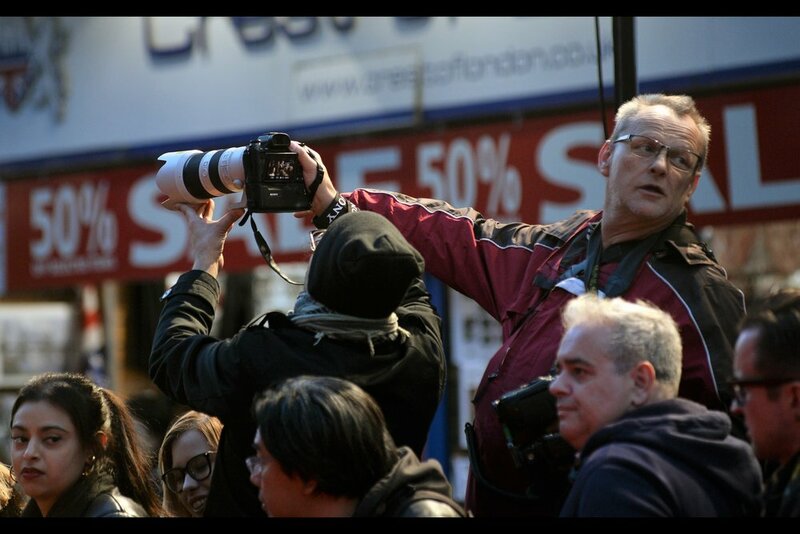 It’s why photography at premieres is not easy. “Sorry, Bob Balaban couldn’t be here” - Amy Nauiokas is one of eight people occupying four differently titled ‘producer’ credits between them. “You’re on wireimage right now, wondering how you managed to miss Keira Knightley at a world premiere at BFI Southbank, deciding instead to do ‘Assassination Nation’ which was an unfunny insulting joke, aren’t you?” - well, not at the time and not for another three or so hours, but back in my apartment…. yeah, kinda. Melissa McCarthy might currently be best known for being in the Ghostbusters remake that ruined everyone’s childhood, but I haven’t watched that movie. I did like (and thought she was very good in) The Heat and Spy, both of which had premieres (she attended the latter. Apparently the chemistry between Melissa McCarthy and Richard E Grant was so good they talked about just getting married inside the cinema. I’m not making that up.. but I can’t confirm the nuptials took place, as I headed off for dinner and a trek to the office after this premiere. I can only confirm by visual confirmation that this many people are required to be standing on this carpet and this time, doing nothing except stand there. Although the extent to which they are vital isn’t easily apparent, you kind of have to assume if they weren’t standing there, doing nothing, the premiere just wouldn’t function. “Awwww… I’m sorry the Ghostbusters remake ruined your childhood. And if you can’t process sarcasm…… that was sarcasm.” Melissa McCarthy was actually exceedingly cheerful and bubbly. Her security dude kept looking at my camera, as if wondering what it did and why I felt necessary to point it in the direction of is client, even indirectly. So… that was actually kind of fun. Not too busy, not too cramped, generally good vibe, two friendly stars. What, other than any other premiere tonight, could possibly go wrong from here? Erm…. take your pick, really. See you in three hours. Facebook = here, but facedbook is a piece of 5h1t. Twitter = here, and might also be, but I think it’s a friendlier platform. +1 for the archive of movie premieres. Newer Post19 Oct - So this is a BFI LFF 'Assassination Nation' European Premiere?